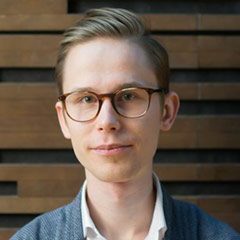 Finnish composer Tuomas Kettunen, a master’s student at the Sibelius Academy in Helsinki, recently concluded a semester as an exchange student at USC Thornton, where he studied with Donald Crockett and took classes in orchestration, game scoring, and music technology. Kettunen shared the fruits of his work from the Writer-Composer class, led by Lisa Sylvester, in which he collaborated with poet Katharine Ogle, a PhD candidate in the USC Dornsife Creative Writing program, and students from the Vocal Arts & Opera program. MATRIX is based on Ogle’s writing and features soprano Maria Lindsey, baritone Matt Hough (BM ’17), and Lisa Sylvester on piano.